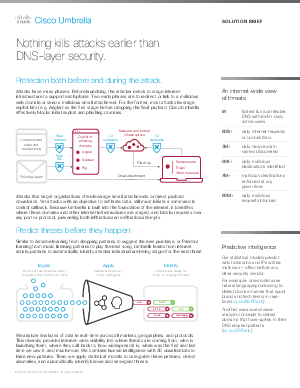 > Cisco Umbrella EMEA > Solution Brief: Nothing kills attacks earlier than DNS-layer security. Attacks have many phases. Before launching, the attacker needs to stage internet infrastructure to support each phase. Two early phases are to redirect or link to a malicious web domain or send a malicious email attachment. For the former, most attacks leverage exploit kits (e.g. Angler) as the first stage before dropping the final payload. Cisco Umbrella effectively blocks initial exploit and phishing domains. Unlike appliances, our cloud security platform protects devices both on and off the corporate network. Unlike agents, the DNS layer protection extends to every device connected to the network — even IoT. Umbrella truly is the easiest and fastest layer of security to deploy everywhere.